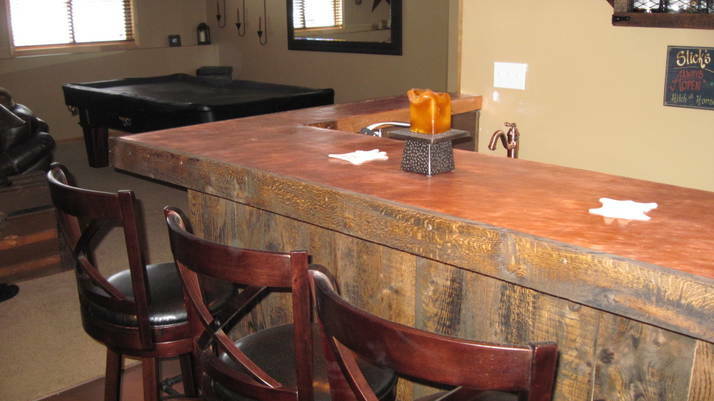 These photos were submitted by a customer who built this custom copper countertop himself. The bar was built with 2' x 4' wood framing, then a sheet of ¾ plywood, followed by 2 x 12s and a thin 3/32nd underlayment for a perfectly smooth finish. He then attached our 16 Mil copper sheeting which is held down with “liquid nails” troweled out (the customer suggests that you do not leave even square inch of uncovered area with this). He then cut the copper with a tin snips and built a brake out of 2' x 4' ’s to bend the copper for the drip rail. He then nailed it with copper nails. After this was done, he didn’t want it to develop a patina and he prefered that it would be just a touch brighter. To accomplish this he took very fine (280 grit) sandpaper and went over entire thing very softly. He was very happy with the way it “popped”. For the sealer he used a 2 part bar self-leveling epoxy approximately 1/8 thick. With some left over material the customer then created a little pub table to the side.